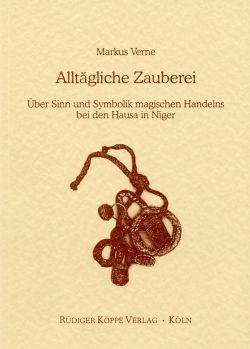 This study is concerned with the meaning and symbolism of using magic among the inhabitants of Zinder (Republic of Niger), a West African city bordering the Sahel region. It is based on ethnographic material collected by the author among the Hausa in Zinder during a nine-month stay in 1995. The book argues that the interpretation of sorcery as ‘ritual’ – i.e. as symbolic action, discussing social, political, economical or whatever dynamics of Hausa culture in an ‘expressive’ manner – is an inadequate reduction of the topic. Instead, when the question of ‘why they do it’ is raised, the explicit intentions of the actors must not be ignored, without reducing sorcery to an effective means to achieve desired results. Starting with a historical survey of the scientific opinions regarding magic, the author critically follows the two major lines of the discussion: both, the ‘literal’ approach with its concern for the logics of human action, and the ‘ritualist’ approach using subordinated aspects of society as frames of reference for its interpretations, are unwilling to take into account the complexity of action in the daily life context – the focus chosen in this book. In the second part, sorcery is therefore analysed from an ethnographical perspective, using the description of a specific magical ritual to open up an approach close to the concerns and preoccupations of the people participating in and interacting with the ritual. The closing chapter contains a symbolistic discussion of ritual actions, again with special emphasis on an approach concerned with the individual’s experience, yet well integrated into a sound scientific analysis.